It was neat to finally see some of the masterpieces that we had studied in our sixth grade Art Appreciation class. It was so beautiful I felt it in my soul, and the desperation and hope of the artist; a tormented being, struggling with bipolar disorder, searching for the grace of God. 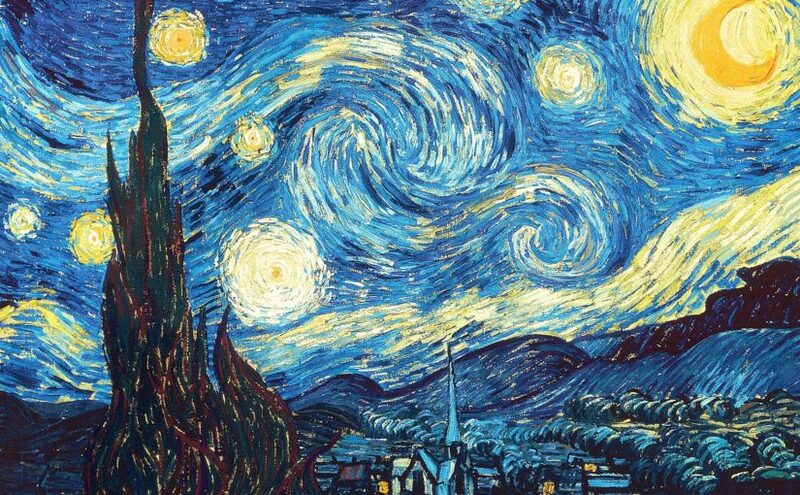 Seeing “The Starry Night” and other original art masterpieces for the first time was a special moment, but my appreciation wasn’t complete without knowing something about the artists. I wanted to understand their stories. Who were these artists, what were their lives about? A masterpiece without a master was just another great painting. I think the desire to understand the artist behind the art is human nature, like the desire to elevate heroes and champions. I wondered; where had this need originated? Was this some biological adaptation, or was it a seed that had been planted in our soul? As a small boy, I loved and appreciated art, especially the artists. My mother and even some of her freinds were artists. These were all wonderfully interesting people that I wanted to emulate. So as a young man I became something of an artist myself; even building my identity upon how people responded what my gift enabled me to create. Years later I finally understood that while it was glorious to revel in the gifts that had been bestowed upon me, my greatest joy was found in worshipping the source of all gifts — it was God, the giver! God was the source of every good thing. But for some reason, in times of need or apathy, instead of turning toward God first, I would often turn to the things that God had created in order to find joy. Each time I did, eventually I wound up disappointed. Temporary happiness, it turned out, was no substitute for eternal joy. God was, and is, and will always be the greatest artist. His art is the creation and everything in it. Remarkably, we too are creative — being made in God’s image. In this way we were made for fellowship with God, and incredible as this sounds, we have a lot in common with the greatest source of power in all existence! Everything in God’s creation was made to reflect God’s glory. The splendor of the natural world, the smile of a child, acts of human kindness or creativity, and even our ingenuity; these are all wonderful expressions of God. Yet none of these amazing and wonderful things are actually God. Humans are God’s finest work, and we are designed for fellowship with God, and to point to, and Glorify God. We are meant to worship the Creator, not the creation — and especially not ourselves! God wants to be known by us so that we might become complete. By knowing God we discover that we are able to have an actual relationship with the creator of heaven and earth. This is a dynamic relationship. Supernatural as this relationship may be, remarkably, it also occurs on a personal human level. It is a relationship that involves the deepest love possible — God’s love for us. This love is expressed in the person of Jesus the Christ; as God who became a man and died willingly to connect us back to Himself; and as our Heavenly Father who allows us to become his children through our faith, by his grace, as we receive His Holy Spirit. We come to experience God as three persons in one godhead — the mysterious Trinity, which reflects the eternal, the personal, and the spiritual nature of God. He is the source of endless and complete joy which is available to us all. We were born to be great people by humbling ourselves before God, honoring and praising God and seeking God’s perfect will over our own. This is the process of the relationship we are called to have. But in order to have this relationship we must first believe God exists. This requires faith. In my relationship with God over the years, one of the hardest parts has been to overcome my pride. It is so hard to let go of two notions: 1. that I am the most important person in my life; and 2. that I am a good person. This is not to say I should be down on myself, but the reality is, I am a sinner, and the concept of my sinful nature has been hard for me to accept. Yet it is this constant imperfection and lack of purity and holiness that separates me from God, but for His grace. Even things that seem good can be sinful. For example, when we worship the creation and not the Creator; or when in the pride of our achievement we take the place of God in our own lives, perhaps unknowingly we put ourselves above God. In this we fall short of receiving the full blessings that God intended for us. God always has a better plan! Despite our constant intentional and unintentional sin, God still provides for us. But it is only by our faith that we are able to be restored into righteous fellowship. Despite our sinful nature, God clears a path, leading us past our sin and directly to Him. There is a catch however; we must believe to receive His blessings and His gifts that are intended to allow us to grow His kingdom and to glorify His name. By the grace of God, by our faith in His mercy, through the sacrificial blood of Jesus, we are forgiven of all sins and our reconciliation to a holy and perfect God is made possible. By faith we trust God and in that trust we are able to fellowship with God. In this fellowship we subordinate our will to God’s perfect will and receive God’s Holy Spirit who dwells within us; and by the power of the Holy Spirit we are changed. As we overcome our sinful nature and participate in the expansion of God’s kingdom, a spiritual reality of amazing proportion and consequence becomes our reality. In the final analysis of our lives, we will confess the name of Jesus and the magnificence of God. We can do this now and enjoy an abundant life of peace and joy despite our circumstances; or we can wait and find out how our trajectory, for all eternity, is determined by what or who we choose to put our trust in. We have free will. It is our choice. Previous Previous post: Mr. Ed?